My first thoughts during intermission at Orphans, the play by Lyle Kessler, were, “I really like this! 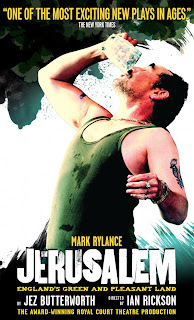 It’s fun and efficient; it’s funny and intriguingly pulpy.” I continued to like the play as the second act played out and as I left the theatre. However, as I was walking home, I started wondering if, despite the fact that I was certain I liked it, the play was actually good. I’m not so certain about that. 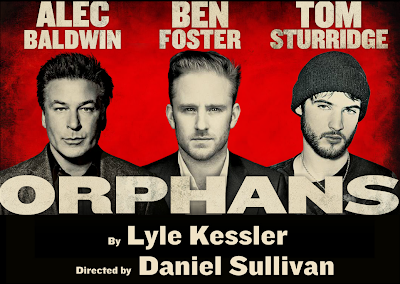 Set in North Philadelphia, this three person play focuses on Treat (Ben Foster), his brother Phillip (Tom Sturridge) and the stranger Harold (Alec Baldwin). Treat and Phillip (both young adults) live on their own, having been orphaned at a young age. Treat, whom Phillip describes as having always been a delinquent, “provides” for himself and Phillip through thievery. Phillip has some (unspecified) mental challenges and is a shut in. They live in squalor but they entertain each other with grand fantasies. Enter Harold, a well-to-do businessman Treat meets at a bar. Drunk and nostalgic for his own youth, Harold (himself an orphan), agrees to go home with Treat. 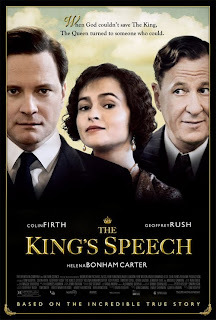 Treat intends for this to be a kidnap and ransom situation, but Harold deftly turns the tables and becomes a sort of Henry Higgins to Treat and Phillip’s Eliza Doolittle. The set up sets us up for lots of fun and laughs. 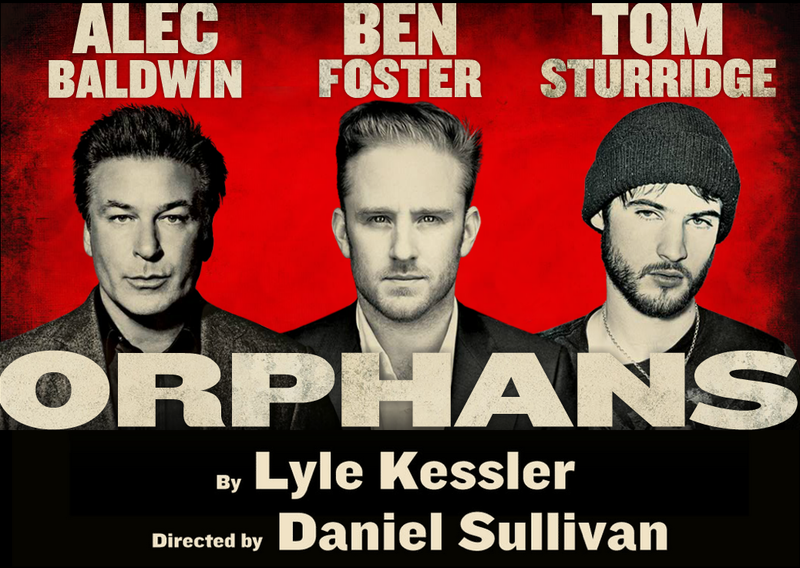 The dynamic between the three orphans is marvelously mercurial and keeps you engaged throughout. As more is revealed about the characters, whether through expository dialogue or through their interactions, they become more and more interesting. In particular, as the gentrified Harold makes over these “dead end kids,” you get the sense that Phillip might have always had mental challenges but they just might have been exacerbated by the way Treat has treated him over the years. On the page, Kessler’s characters are a bit stock, but the actors imbue them with depth. 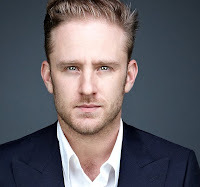 (You may recall that there was much ado about a change in casting; more on that in a moment.) 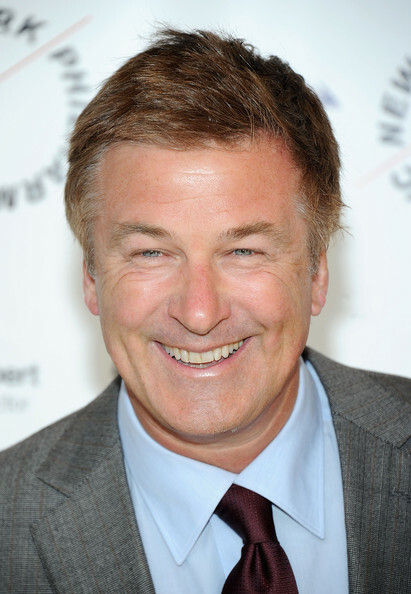 Returning to the stage after his renaissance on 30 Rock, Alec Baldwin is good as the somewhat-shifty Harold. His performance isn’t revelatory (in fact, as Harold becomes more and more the mentor, Baldwin reminds us more and more of Jack Donaghy, though that’s more to do with the way the character is written than the way he’s played), but he’s good and adds gravitas to the character. 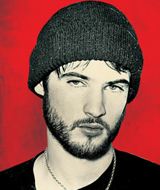 Tom Sturridge impresses in his Broadway debut. (Best known to some – not me – for his film work, he has appeared on stage in the UK.) From where I was sitting, Sturridge looked and sounded a little like Andrew Garfield, and his character’s ticks were similar to those of Leonardo DiCaprio’s character in What’s Eating Gilbert Grape?, but his soul and physicality are stand out achievements. His lanky body leaps and crawls all over the stage and everything on it, like a twitchy spider, which helps to outwardly express the change Phillip goes through over the course of the play. 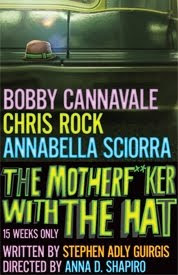 Originally, Shia LaBeouf was cast as Treat but after the first day of rehearsal, LaBeouf was fired/left the production due to creative differences (depending upon which story you read and believe). Ben Foster was quickly cast as a replacement, and I’m so glad. In the end, we’re left to wonder what an orphan is. Sure, there’s the dictionary definition, but is an orphan simply someone without parents, or is it someone without someone to love him, someone to offer him, as Harold does throughout, some encouragement? I liked this provocation and enjoyed the play while I was watching it, but as I walked home, I started questioning its merit. For example, we never learn what Phillip’s mental capacity is. We never learn what makes Treat go from “I don’t like people telling me what to do” to burglary and muggings. Most important and perhaps most disturbing, we never learn who Harold really is. Why was he run out of town? (He talks about starting out in Chicago and not being able to go back there.) What kind of business is he in? Why does he go home with Treat and then take the boys on as wards? It can’t just be his obsession with “dead end kids,” can it? Was it that he felt a kinship with these orphans? He’s truly a kooky guy, and that isn’t addressed. Visit orphansonbroadway.com to learn more about the play and to purchase tickets.